This is another example of luck trumping skill. I forget what street I was on in Savannah, but across the street I saw an interesting looking couple. He appeared rugged looking, with a beard, and on his back was a guitar in a canvas case. 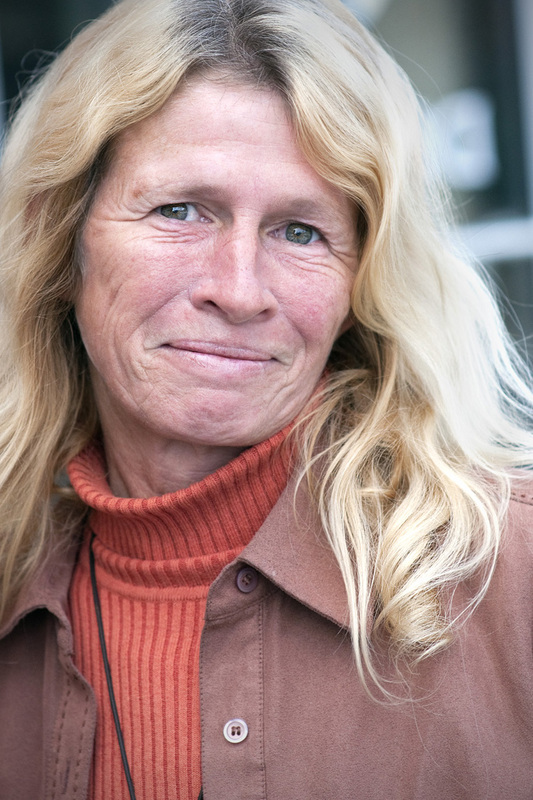 She had long flowing blond hair and was holding a leash for a large dog. They were speaking to someone, and were on the other side of the street, half a block away. So I waited for the conversation to end before I made my move. But while I was not paying attention, the conversation ended and they were walking quickly in the opposite direction. I walked parallel to them on the other side of the street when suddenly they turned left, getting further away. Well, I accepted the fact that the opportunity was lost, turned around, and headed back. The next morning I was on River Street, the main touristy drag with tee shirt shops, eateries, etc. And there they were – a second chance. Again they were talking to a lady, but this time I walked up behind them and waited my turn. I felt sort of like in elementary school, waiting on line for the restroom. Finally, they looked up, smiled, and I asked my question (more on the wording, below). They were happy to comply. Dale is a traveling musician and was proud of a recently created youtube video. You can see it HERE. They have been WALKING through the southern U.S., and couldn’t be happier about the experience. Along the way, they picked up their rescue dog, Mr. Biggs. You might think that with this kind of lifestyle, that Mr. Biggs would look a bit bedraggled. But he is beautiful, with a soft shiny coat. Clearly, he gets good care. As a former welder, Dale’s goal is to fabricate deep sea fishing type fighting chairs for disabled veterans – amputees. He wants to meet individual amputees, judge their needs and create a customized fighting chair so that they can go deep sea fishing. What a great goal! Now, here is something new for me. Several photographers have inquired about how I approach strangers. So this is my first attempt at a brief podcast (~2 minutes) describing my style. Listen to it by clicking CLICK HERE at the bottom. This podcast plays fine on my two PCs. Hopefully it will play for you too.